Gur-Emir Mausoleum, Monuments of Uzbekistan, Sights of Uzbekistan, Sights of Samarkand. Gur-Emir Mausoleum is one of the finest examples of medieval architecture of the East, in Persian means (“Tomb of the Emir”). Construction of the mausoleum was begun in 1404 in southwestern part of the city. 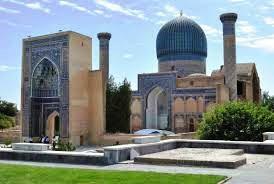 Mausoleum is the family tomb of Timurids. The domes and glaze were restored in 1967. Guri-Emir is one-dome building with the tomb. Unusually beautiful effect creates a geometric mosaic ornament, shining brightly in the sun. Mosaic of light and blue glazed bricks is decorated the walls of the building. The tile of mosaic installed above the entrance says that this is the tomb of Amir Timur Guragan. You will be amazed by the richness of the interior decoration. It is important to note that the medieval art of stone carving reached its artistic prosperity when the work was carried out on finishing the mausoleum. The bright-blue dome is decorated with gold paintings; its diametre is 15 metre, height is 12,5 metre. Big hollows give the dome amazing expressiveness. Inside Gur-Emir is a big, high building with deep niches on the sides. There is a panel of onyx tiles at the bottom of the mausoleum, each of which is covered with exquisite paintings. Stone tombs are under the dome, surrounded by beautiful arch of marble. The most beautiful is the tomb of Timur, made of dark-green nephrite. There are crypts and tombs of Timur’s sons and his grandson Ulugbek, made of white and grey marble. The masterpiece of medieval architecture – mausoleum Guri-Emir holds the important place in the history of the world Islamic architecture. Gur-Emir served as a prototype for such important monuments as mausoleum Humayun in Deli and mausoleum Taj-Mahal in Agra.